I’ll have tips for the PGA Championship 2018 on Tuesday or Wednesday. The 100th PGA Championship takes place from August 9th to 12th in Town and Country, Missouri at the Bellerive Country Club. This is the final major of the 2018 season and the final time this tournament will take place in August as it will move to May in 2019. The Bellerive Country Club has hosted a PGA Major tournament two other times with the most recent being in 1992 for the PGA Championship. They also hosted the US Open in 1965. They’ve also hosted the Senior PGA Championship, BMW Championship and U.S. Senior Open. This is typically the highest quality of field as the selection process is limited to the most successful golfers over the past year with the field being mostly made up of former major winners, the top 70 in official money standings and low scorers. Sixteen former champions are expected in the field. We’ve done well here over the years. In 2017, we had Hideki Matuyama and Rickie Fowler. While neither of them won, they both finished top-five for the E/W cash. The 2016 PGA Championship we were this close as we had Jason Day to win this thing and he finished just one stroke behind Jimmy Walker for the championship. Still, that made for a nice E/W win. We also hit a E/W bet in 2015 as Justin Rose started at 18/1 and ended up finishing fourth in the field, -6 strokes behind the winner Jason Day. This is considered a long course so we could see some of the big hitters looking good here. This might explain why Francesco Molinari is at just 30/1. He’s been one of the hottest golfers this season and is coming off The Open Championship win. The storyline of this tournament early will be Tiger Woods quest to win again. This has dominated television this year and he drew some big ratings when he led during The Open Championship. Last week was a bit of a letdown, but you have to think he had his mind on this one as he’s a four-time PGA Championship winner. Brooks Koepka is another one to keep an eye on this week as he always manages to show up for majors. He’s finished T13, T4, T5 and T15 over the past four years at the PGA Championship while also winning back-to-back US Opens. Before this past weekend I would’ve been looking at Rory McIlroy here, but he absolutely collapsed in the final round at the WGC-Bridgestone to the point where people were wondering if he was okay. 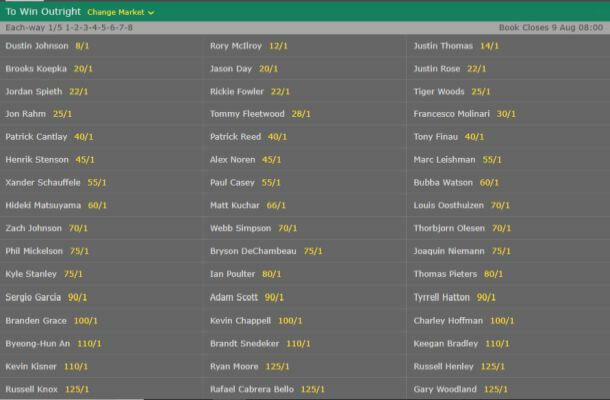 Justin Thomas won that one and he, along with Dustin Johnson, are the the rightful favorites here as they are 1-2 in the world. Of course, just looking over the past couple of years in this tournament it’s hard not to like Jason Day here. He won in 2015, was second in 2016 and T9 in 2017. He’s rounding into form and loves this tournament. I’ll be crunching the numbers and have our full tips for this tournament up later this week.